Which food delivery apps are best in Springfield? There are quite a few choices when it comes to fast food around campus. But restaurants like Burrito Bowl only stay open until 7:30 p.m. on most weekdays. This is what makes apps like Uber Eats and DoorDash so popular — you can order from a list of restaurants in town that are still open, and the food is brought straight to your door. But which apps do people in Springfield actually use? Lauren Creek, freshman psychology major, said DoorDash works well with their customers, has the most options and has the most accurate service for their customers. Creek said she uses it for convenience. Creek also suggests giving specific directions when navigating drivers to campus because they have difficulty finding specific residence halls. Gaby Farabee, senior cell and molecular biology major, said the main difference in these apps is the restaurant choices — and even some overlap. Farabee said she has used Uber Eats the most and likes to order food from Bairs about once every couple of weeks. Megan Craven, senior international business major, said she prefers Uber Eats because she likes being able to see where her driver is in real time. “I like the options that Uber Eats has and I’ve had cheaper delivery fees compared to GrubHub,” Craven said. Some people have not had good experiences with these apps altogether. Peyton Nordin, freshman, said Uber Eats and Postmates tend to mess up her order, GrubHub takes a long time and her food arrives cold from DoorDash. Nordin said the best one to order from is Uber Eats because they have the best selection. “I’ve also had issues with all of them not picking up my order but making me pay for it,” Nordin said. Uber Eats’ delivery costs are between $3-$10 and delivery times are estimated at 30-40 minutes, according to their app. Some restaurants available through Uber Eats include Sonic, McDonald’s and Fuddruckers. DoorDash’s delivery costs are between $2 and $5, and delivery times are between 25-40 minutes. Restaurants available through DoorDash include McAlister’s Deli, Moe’s Southwest Grill and Springfield Family Restaurant. Restaurants available through Grubhub include Taco Bell, Bambino’s Cafe and Red Lobster. So, is it worth it to drive for these apps? Sophia Passantino, senior public relations major, said she enjoys driving for Postmates because she gets to choose when she wants to work. Passantino also said Postmates offers “bonus” shifts during certain time periods so drivers can earn an additional $3 on top of the standard $4 per delivery. Overall, there is no “one size fits all” delivery app for Springfield. It’s probably best to try these apps and decide which one is worth paying for. Postmates is launching a new national ad campaign, following in the footsteps of market competitors Uber Eats, Grubhub, and DoorDash this year. The delivery service will enact the first phase of its new marketing strategy this spring by advertising to diners on billboards, bus benches, and via dedicated wall murals around Miami, New York, and Los Angeles. The advertisements will feature messaging tailored to local audiences, “right down to the street they appear on,” according to a release. Postmates also hinted in a prepared statement that its new creative material will be a part of an extended marketing campaign that will involve TV advertising in the coming months. Television is quickly becoming an integral part of how third-party delivery companies raise brand recognition, as they attempt to capture more restaurant partners and market share. Last month, Uber Eats shelled out nearly $9 million on its first nationwide television campaign in partnership with the NCAA. DoorDash also rolled out initial national TV ads at the beginning of the year, highlighting restaurant chain partnerships with Wendy’s, Chipotle, and Chick-fil-A, among others. Meanwhile, Grubhub, Yum Brands official delivery partner has featured on multiple Taco Bell TV spots this year. The company’s initial choice to roll out this campaign in dense, urban markets speaks to the delivery service’s city-focused roots, right down to the image of a bicycle rider for a logo. According to data analytics firm Second Measure, Postmates is the most popular delivery service in Los Angeles, taking up 42.6 percent of market share in the area as of December 2018. On a nationwide level, Grubhub, DoorDash, and Uber Eats all claim more market share. Postmates has been gearing up on product launches, including a new shared ordering function called Postmates Party ahead of its expected IPO. The company confidentially filed the initial paperwork to go public earlier this year, according to Bloomberg. Postmates was valued at $1.85 billion in January. Stephens Investment Management Group Llc, which manages about $3.08B and $4.22 billion US Long portfolio, decreased its stake in Msc Indl Direct Inc (NYSE:MSM) by 10,091 shares to 387,683 shares, valued at $29.82M in 2018Q4, according to the filing. It also reduced its holding in Idexx Labs Inc (NASDAQ:IDXX) by 2,761 shares in the quarter, leaving it with 267,027 shares, and cut its stake in Tyler Technologies Inc (NYSE:TYL). More notable recent Grubhub Inc. (NYSE:GRUB) news were published by: Investorplace.com which released: “Why Marijuana REITs Are One of the Best Investments Today – Investorplace.com” on March 19, 2019, also Benzinga.com with their article: “Benzinga’s Top Upgrades, Downgrades For April 3, 2019 – Benzinga” published on April 03, 2019, Investorplace.com published: “15 Stocks That May Be Hurt by This Yearâ€™s Big IPOs – Investorplace.com” on March 14, 2019. More interesting news about Grubhub Inc. (NYSE:GRUB) were released by: Nasdaq.com and their article: “Can Blue Apron’s New CEO Execute a Hail Mary Play? – Nasdaq” published on April 04, 2019 as well as 247Wallst.com‘s news article titled: “Top Analyst Upgrades and Downgrades: Alcoa, AMD, Caterpillar, CSX, Intel, Nvidia, Raytheon, Suncor, Square, Walgreens and More – 24/7 Wall St.” with publication date: April 03, 2019. Since January 29, 2019, it had 0 insider purchases, and 7 selling transactions for $42.25 million activity. BURROWS CLIFFORD sold $10.26 million worth of Starbucks Corporation (NASDAQ:SBUX) on Tuesday, January 29. Another trade for 169,096 shares valued at $11.64 million was made by CULVER JOHN on Thursday, February 7. More notable recent Starbucks Corporation (NASDAQ:SBUX) news were published by: Nasdaq.com which released: “Starbucks (SBUX) Gains But Lags Market: What You Should Know – Nasdaq” on March 18, 2019, also Nasdaq.com with their article: “3 Big-Business Things a Small Business Must Do – Nasdaq” published on March 21, 2019, Nasdaq.com published: “Dave & Buster’s (PLAY) Q4 Earnings: Unit Growth Holds the Key – Nasdaq” on March 29, 2019. More interesting news about Starbucks Corporation (NASDAQ:SBUX) were released by: 247Wallst.com and their article: “Starbucks Includes Accelerated Share Buyback in Annual Shareholder Meeting – 24/7 Wall St.” published on March 20, 2019 as well as Nasdaq.com‘s news article titled: “McDonaldâ€™s Now Is in the Tech Game but It Wonâ€™t Matter for MCD Stock – Nasdaq” with publication date: March 29, 2019. He says more promotions from companies like DoorDash, UberEats, and Postmates are driving more customers to their phones for food. CLEVELAND — Food delivery apps are constantly trying to win your business by offering weekly promotions. 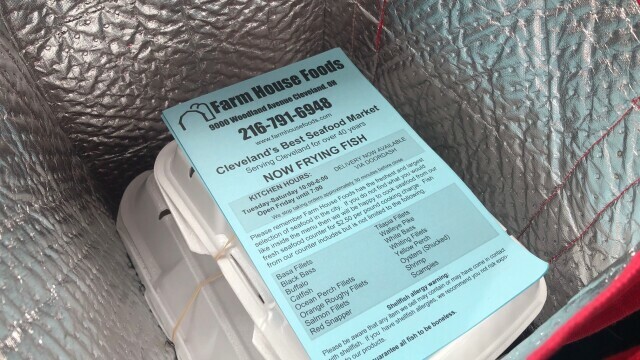 A late-morning lunch rush sends Harold Craig from Dante’s Inferno in the Flats all the way to a fresh fish market on the east side, picking up other people’s food. “If you can pay $3.99 to save you an hour of your time, it’s worth it,” said Craig. Craig drives for a few different food delivery services and says he’s figured out the differences in how each one pays for their service. “The companies will give promos there because they want to fight over the business that they generate,” said Craig. 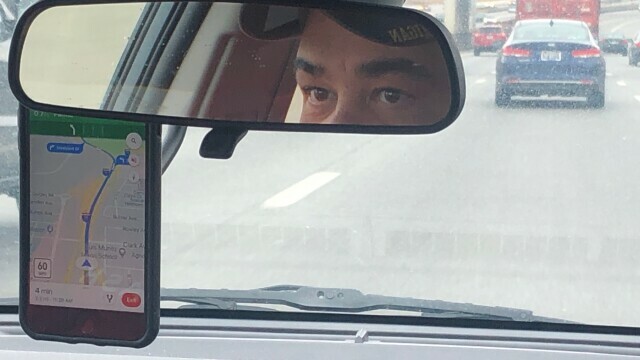 Craig’s eyes in the rear view mirror while he drives to delivers an order during lunch. 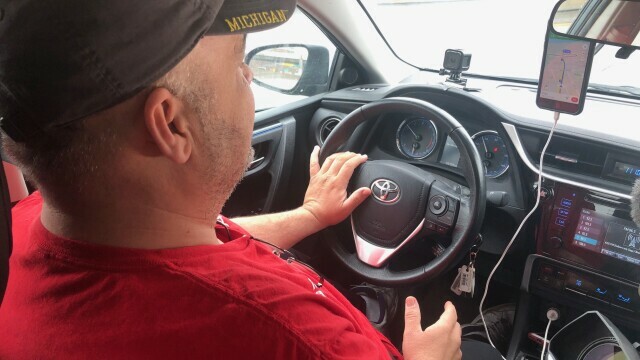 One of Craig’s deliveries one afternoon was to the Northeast Ohio Regional Sewer District building, where Ramone Smith works and says those kinds of orders are pretty common. Customers like Smith can be on the receiving end of an onslaught of deals and offers. One deal for March Madness, another to lure new customers, a third just because it’s Friday. 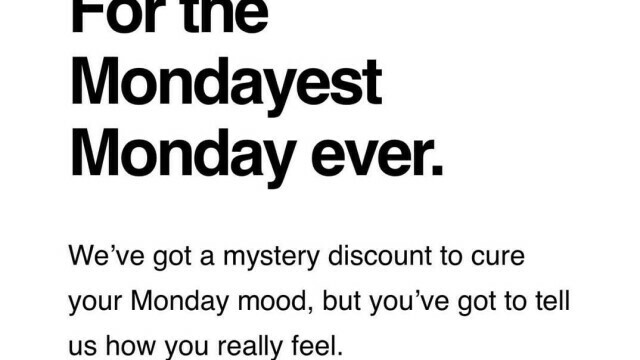 One promo send to DoorDash customers offers discounts just for it being Monday. The goal is to create loyalty, but it actually results in the opposite. “You hop from app to app just to see what are the best deals because all the prices vary,” said Smith. An order sits in Craig’s DoorDash delivery bag. None of the companies would answer News 5’s questions about how they give out promotions, but restaurants are benefiting, too. 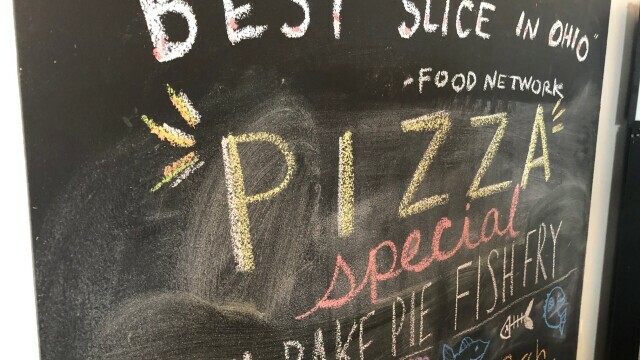 A sign in Crust’s Tremont location. Griffin says she’s never had to hire a delivery driver because it’s so easy for customers to order food online, and the apps send their own drivers to deliver the meal. “Especially around Tremont, everyone uses UberEats,” said Griffin. 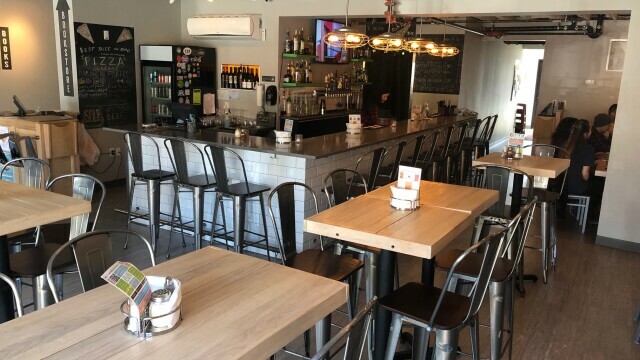 Crust in Tremont has more room for seating compared to it’s original location on the east side. Griffin says that’s why food delivery apps helped their business from the start. She says online orders account for about 10 percent of their business between both of Crust’s locations. With time, she thinks that will only grow. “If I can make some money off people being lazy, people are used to making money off me being lazy, so why not,” asked Craig.